Albers received his artistic training at the Königliche Kunstschule (1913-1915), the Kunstgewerbschule (1916), the Königliche Bayerische Akademie der Bildenden Kunst of Munich (1918-1919), and the Bauhaus, in Weimar (1920-1923). Initially, he practiced figurative painting and graphic arts. As a student in Weimar, he became interested in geometric abstraction. He created glass works, designed furniture, and produced photographs and collages. In 1923 he became a professor and taught an introductory course at the Bauhaus. The following year he began to publish his writings on art theory and art education, an activity he would continue to pursue the rest of his life. His contributions to the development of artistic training programs were some of his fundamental achievements. In 1925 he married artist Annelise Albers (née Fleischmann), who studied at the Bauhaus. After receiving a Masters degree, he moved to Dessau when the Bauhaus moved its headquarters there. When financial problems forced the Bauhaus to move again in 1932, this time to Berlin, and Albers moved there too. By 1933 Nazism’s pressure became unbearable and the Bauhaus closed its doors. Albers migrated to the United States to teach at Black Mountain College, a liberal arts college founded that same year near Asheville, North Carolina. During his years as a teacher at Black Mountain College he continued to practice graphic arts, abstract painting, drawing, and collage. He also regularly exhibited his work in U.S. galleries. Among the series of abstract lithographs from this period are Graphic Tectonics (1942-1944)—compositions devoid of color in which continuous and parallel lines were broken at right angles leaving empty spaces on the surface of paper, resulting in surprising effects of volume and planes. In 1947 Albers began the series of paintings called Variant / Adobe because of their resemblance to the typical facades of adobe houses. In them, the simplest form of a horizontal rectangle with two small vertical windows allowed him to explore different combinations and chromatic variations, exploring the possibilities of color interaction. In 1949 Albers left Black Mountain College. He traveled to Mexico (a country he frequently visited since his arrival in America) and taught at the Universidad Autonoma de Mexico. Back in the United States, he conducted the first studies for the series Structural Constellations (graphic arts) and Homage to the Square, which he continued to develop throughout his life. In Homage to the Square, a long and rigorous series, Albers continued the research he began in Variant / Adobe on the way colors interact in certain regular formats, in this case on a set of concentric squares. Using these forms and by means of a more refined technique, he demonstrated that colors and shades alter their intensities depending on the colors that surround them. Drawing upon this effect he was able to give the squares in his works an ambiguous and unstable appearance, thus demonstrating that human perception is not infallible. In Structural Constellations Albers abandoned the study of color to focus on the study of form. He drew complicated geometric figures impossible in the real world, demanding great effort from the spectator. In 1950 Albers was appointed Head of the Department of Design of the School of Art at Yale University (New Haven), a post he held until 1958. He was frequently invited to guest lecture at universities in America and Europe. After his academic retirement he had the opportunity to implement his ideas about the integration of art and architecture by designing murals and sculptures such as Two Portals (Time & Life Building, New York, 1961), Manhattan (Pan Am Building, New York, 1963), Repeat and Reverse (Art and Architecture Building, Yale University, New Haven, 1963), Growth and Loggia Wall (Rochester Institute of Technology, 1967), Gemini (Grand Avenue National Bank, Kansas City, 1972) and Reclining Figure (Celanese Building, New York, 1972). Josef Albers’ findings (especially with respect to optical effects achieved with great economy of means) established him one of the founders of Op art and a precursor of Minimalism. During the 60s he continued to be recognized for his influence and his contributions to art theory. In 1963 he published his theoretical work Interaction of Color about the perception of color. The following year, the Museum of Modern Art organized the traveling exhibition Homage to the Square, which was shown in Venezuela, Uruguay, Argentina, Peru, Brazil, and the United States between 1964 and 1967. In 1965 he was included in the historical exhibition The Responsive Eye (Museum of Modern Art, 1965), which brought together an important group of artists who studied the illusion of movement and the interactive phenomena of color in art. 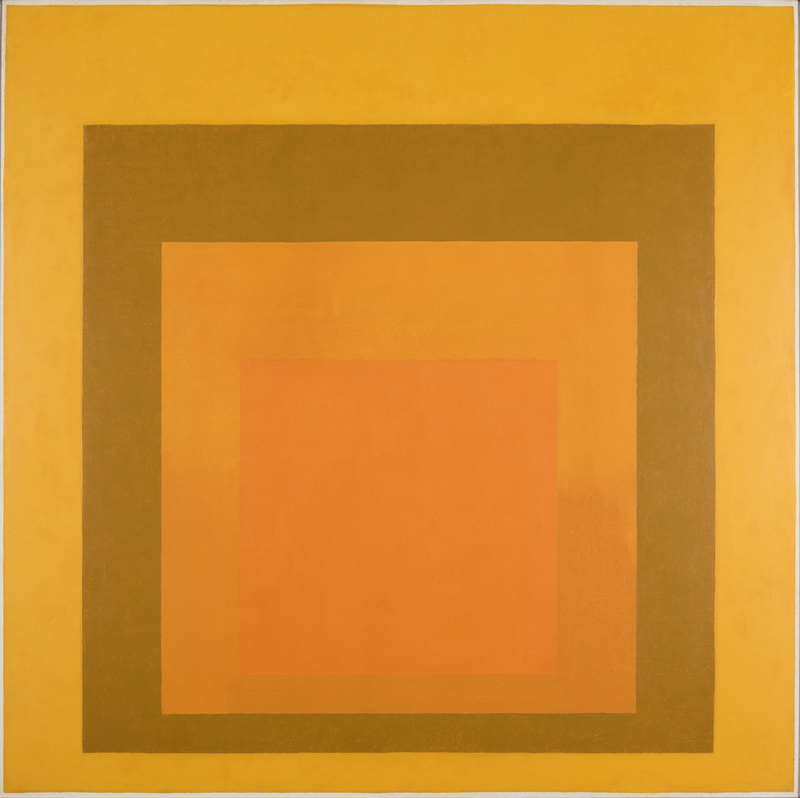 In 1971, Albers became the first living artist to be the subject of a retrospective at the Museum of Modern Art in New York. Albers, Josef. Structural Constellations. New York, 1961. Albers, Josef. Hommage to the Square. New Haven, 1962. Albers, Josef. Interaction of Color. New Haven, 1963. Albers, Josef. Search versus Research. Hartford, 1969. Albers, Josef. Articulation. New York, 1972. Miller, J. (ed.). Josef Albers. Prints 1915-1970. New York, 1973. Alviani, Getulio (ed.). Josef Albers. Milan, 1988. Benezra, N.D. The Murals and Sculpture of Josef Albers. New York, 1985. Josef Albers. Despite Straight Lines. An Analysis of His Graphic Constructions. New Haven, 1961. Weber, N.F. (ed.). Josef Albers. A Retrospective. New York: Solomon R. Guggenheim Museum, 1988. Gomringer, E. Josef Albers. His Works as a Contribution to Visual Articulation in the 20th Century. New York, 1968. Light, F. y Weber, N.F. (eds.). Josef Albers, Color and Light. New York: Solomon R. Guggenheim Museum, 1994. Lück, M. y Schmidt, A. Albers Bibliographie. Bottrop, 1983. Weber, N.F. The Drawings of Josef Albers. New Haven-London, 1984.